The Millennium Forum has just announced its new season of events taking us into the Spring/Summer Season for 2017. The May-August brochure has now opened for bookings at the Box Office. The new season begins with City of Derry Jazz & Big Band Festival headliner, Imelda May, who has added a second night on May 1. 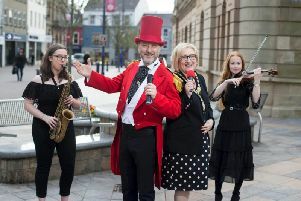 The Walled City Tattoo returns with their magical rousing beats in May while there’s more music with The Magic of Motown in the same month. Country music’s Nathan Carter is back this season as are acclaimed traditional musicians Paul Brady and Andy Irvine on their 40th anniversary tour. The headline West End show this season is Tim Rice and Andrew Lloyd Webber’s Joseph and the Amazing Technicolor Dreamcoat, starring X Factor winner, Joe McElderry, which makes a welcome return to the cityside venue in May/June. Younger audiences are well catered for with the stage production of the classic nursery rhyme Humpty Dumpty in May. The producers of Room on the Broom also return with We’re Going on a Bear Hunt - Live On Stage in June. The latter is direct from a smash hit West End season and international tour and brings Michael Rosen’s award-winning book vividly to the stage. The Forum’s annual youth arts festival, INTERACT, returns this summer, with a developed format bringing the best the festival has to offer for 12-21 year-olds. Young people are on stage again this season with the return of the Youth Musical in August and their production of the hit musical, West Side Story. Booking for the new season is now open. Telephone 028 71 264455 or visit www.millenniumforum.co.uk for bookings.